The Consumer Federation of America leads a coalition of individuals and organizations dedicated to reducing deaths and injuries caused by off-highway vehicles (OHVs). OHVs are made up of three main subsets of vehicles: All-Terrain Vehicles (ATVs), Recreational Off-Highway Vehicles (ROVs), and Utility Task Vehicles (UTVs). All of these vehicles carry risks of serious injury and death when not used properly or with the appropriate safety equipment and all of these vehicles could be made safer with a few common sense design changes. CFA’s OHV Safety Coalition (OSC) focuses its work on proper use (specifically keeping OHVs off of roads) and supporting common sense safety requirements in OHV design. The coalition sends letters opposing proposed ordinances, laws and polices that would endanger the public by increasing recreational ATV access to roads, which can be found here. The Consumer Product Safety Commission (CPSC) collects death and injury data related to ATV use but there is a significant time lag in the data—the 2013 report, for instance, was released in 2015 and the most recent complete data in that report was from 2009. In an effort to present decision makers with the most up to date data the OSC began collecting data in 2013 and now has the most current OHV fatality data we are aware of. By tracking news reports, coalition members compile an ongoing spreadsheet of OHV fatalities. As of April 1, we identified 56 OHV fatalities in 2019, comprised mostly of ATVs and ROVs. Review our 2018 spreadsheet where we identified 462 fatalities, comprised mostly of ATVs and ROVs. We are continuing to collect data on 2018 deaths. Review our 2017 spreadsheet where we identified 507 fatalities, comprised mostly of ATVs and ROVs. We are continuing to collect data on 2017 deaths. Review our 2016 spreadsheet where we identified 679 fatalities, comprised mostly of ATVs and ROVs. Review our 2015 spreadsheet where we identified 612 fatalities, comprised mostly of ATVs and ROVs. Review our 2014 spreadsheet where we identified 649 fatalities, comprised mostly of ATVs and ROVs. Review our 2013 spreadsheet where we identified 575 fatalities, comprised mostly of ATVs and ROVs. 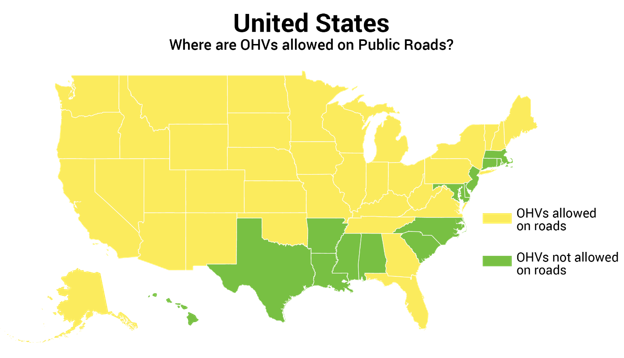 that OHVs are unsafe on roadways, an increasing number of states have passed laws allowing OHVs on public roads, and additional states and counties are currently considering such laws. 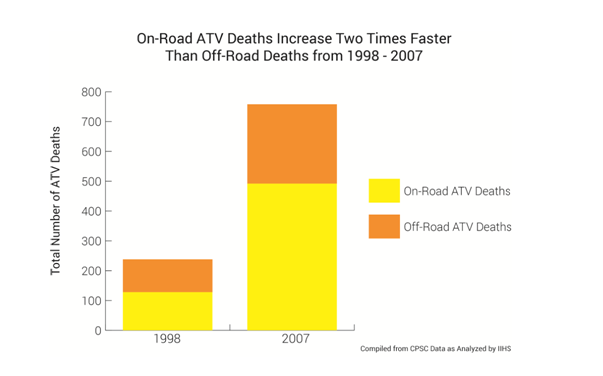 The majority of ATV deaths (65% in 2007) take place on roads and action is needed to reverse this dangerous trend. In response to this problem, CFA has brought together a coalition of individuals and organizations dedicated to reducing deaths and injuries caused by OHVs. As part of our efforts to reverse the trend toward increased OHV use on roads, our coalition works together to educate the public and decision makers about the dangers of allowing OHVs on roads. Inadequacy of measures to ensure seat belt use by occupants in ROVs. The same test procedures to measure the vehicle handling properties of cars and light trucks should be applicable to ROVs. A broad coalition from the insurance, public health and product safety and consumer advocacy realms signed on to letters in opposition to bills that would have delayed the CPSC’s ROV rulemaking. Data from the Consumer Product Safety Commission (CPSC) from 2007 (the most recent complete data), as analyzed by the Insurance Institute for Highway Safety (IIHS).